Posted by jeninmaine in renovations, sewing. I’ve been looking at my teensy kitchen forever and wanting to do something, anything to it. It’s just anything we do will cause a huge amount of upheaval that I haven’t been ready to deal with. I was thinking, however, of at least replacing the curtains. I made window curtains a few years ago that I like, but the tiebacks are getting faded from the sun and they’re not exactly what I want and I never finished that set for the door to the extension so I’ve been wanting a change, just not sure what kind of change. 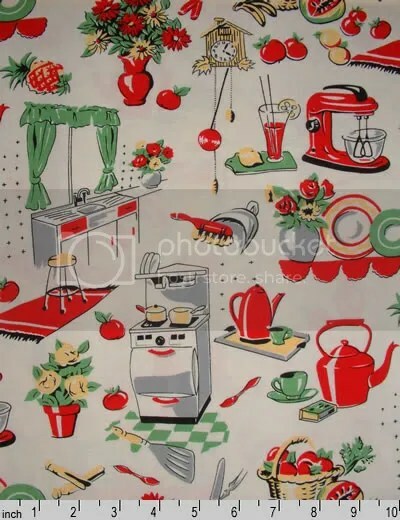 It’s called “Fifties Kitchen”, quite appropriately, and oh my, it is exactly my kind of thing. Maybe it’s because I have a red KitchenAid mixer, I don’t know, maybe it’s the red clock I thought I was going to hang in my craft room, maybe it’s just that shiny red things and mellow green things are oh so exciting to me, but I got very excited just seeing it. “Those are my curtains,” I thought to myself. Then I got to thinking about the project I’ve always wanted to do, which is remove all the upper cabinet doors and paint the inside a color and paint the outside white (thank you, Martha). I realized that using that green would be *perfect* for such a task, and then I just started thinking and thinking and wheeee! So here’s the plan – Michael is building a few more shelves into our pantry, then he’s going to take down the cabinet doors and we’ll fill the nail holes. The outside of all the cabinets will be painted white, and the insides will all be painted green, and we’ll do a similar thing in the pantry. The cabinet doors left on the bottom cabinets will also be painted green and I’ll probably try to find some different inexpensive hardware. We’ll peel the wallpaper and paint the walls either white or the same green as the inside of the cabinets. I’ll hang my red clock in the kitchen, the mixer is already prominently displayed on the counter, and I’m currently stalking red rotary dial wall phones on the off chance I find one in good working condition. I’m hoping I can score one on eBay or, better, at a yard sale around here. We had that exact same phone when I was growing up in baby blue. I loved that thing. And of course, the curtains! I poked around online and decided to make cafe curtains with a valance because they’ll be super easy to make and I have everything already except the spring rod, which I can pick up pretty cheap. On Saturday we were at Lowe’s (I had coupons of course :) and I brought the fabric so I could get paint to match the green and ended up with a hue named Hearty Hosta – while I don’t like hostas I will make an exception in this case. I got one can of that and one can of brilliant white, both in semi-gloss. So now I have the fabric and I have the paint. Not to mention I have this cast iron trivet that was my grandmother’s that reads, “The hurrier I go the behinder I get” – anyone from the Northeast would probably recognize one of these things in an instant, they were really popular in the 60s and 70s. Everyone had one hanging on the wall with some witty saying about a woman’s work or a man’s uselessness. This is a pretty big undertaking for we with children and doing it ourselves, so I think I’m going to focus on just getting that much done initially. Once this is said and done I really want to look at getting the awful countertop replaced, a new not-fugly ceiling light fixture and maybe doing some tiling. I don’t know, it’s all up in the air right now but I figure one thing at a time. If we can manage a half-decent kitchen refresh for under $500 I’ll be mighty pleased with myself. To make sure I had enough fabric I bought five yards, and soon realized that five yards is a LOT. I’m going to have tons left over to make all sorts of things – an apron, potholders, placemats, a mixer cozy, maybe? I’ve been getting a lot of inspiration from a great website called retro renovation, whose tagline is “Love the house you’re in.” It seriously makes me miss that apartment I had with avocado bathroom fixtures.